We’ve been living off the food of the farm this week, with hardly any outside purchases at all. None of it has been fancy or exotic, but we’ve been working so hard that I have to do whatever gets calories into us, quickly. I made a flavor-bomb of a sandwich for lunch today, though. It’s still raining raining raining and I wanted something Not Bland. I made fresh potato rolls, which came out divine. I put on some of our own turkey that I roasted a couple of weeks ago. Yum. A little homemade mayo, but then added horseradish, then radishes, spinach and lettuce from the garden. I topped it with some extra sharp Cabot cheddar that’s been sitting out for a while so the flavor really develops. Divine. 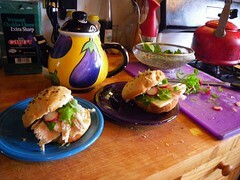 My Eat Locally in the Monadnock region blog called Mmm … Monadnock! is up and running again, with help from the Allosso family. Go say hi! I turn out to eat a mostly zero-mile diet, living almost exclusively off my own farm. They live in downtown Keene and are actively seeking out local sources for their food. If you are in the area, I bet you’ll learn a lot from them, and they’d love to hear from you as well. As would Frank and I. This looks positively delicious – and I love your pitcher in the pic! Here’s the recipe I used for my rolls this week. A keeper!